Focus groups lend an important qualitative dimension to any research project. They help identify key issues and increase the number of hypotheses that will be tested in later phases of the project. They also allow our clients to get to see their customers and constituents as people, not statistics. Focus groups are semi-structured discussions, carefully directed by a professionally-trained moderator. Early in the discussion we get to meet the participants, see their initial body language, and listen to the words they use to voice their major concerns. As the discussion continues, the moderator subtly guides the participants to topics of primary interest to our clients – whether it’s voters’ perceptions of a specific Congressional race, consumers’ attitudes about a specific product category, or people’s feelings about a specific issue area. The moderator probes and probes, pushing beyond simple answers, to the complex attitudes and conflicting emotions that may lie beneath the surface. Focus groups can be arranged in a matter of a few weeks. Generally, 8 to 12 participants are carefully screened and recruited for each group. In the meantime, through meetings and conference calls, a discussion guide is drafted and refined. 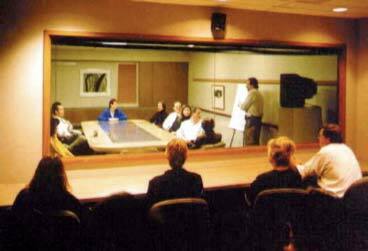 The groups themselves take place in a specially designed room with hidden microphones and a large one-way mirror that conceals the client viewing room. The sessions are taped, and a complete report is built around the verbatim responses of participants. The report is analytical, but it retains the character and emotional content of the participants’ comments.